The EA uses the strategy based on breakout. Breakout trading is one of the most popular and most frequently used strategies among Forex traders. This strategy has been developed a long ago and has been repeatedly tested on history data, showing superior results. The EA uses 3 types of trend breakouts, (support and resistance breakout, downtrend breakout, uptrend breakout). The EA uses a very small SL so the account is always protected from equity drawdown with a very low risk-per-trade. It uses an adaptive trailing stop algorithm. The EA uses a system of closing positions during slippages. It was backtested and optimized using real ticks with 99,9% quality. It has successfully completed stress testing. The EA contains the algorithm of statistics collection with output on the information panel. Working currency pair/timeframe: EURUSD M30. Before using on a live account, test the EA with minimal risk. Low spreads + low commission + high quality execution are important when choosing a broker to trade. Maximum Spread — from 0 - 20 points ( 0.0 to 2.0 pips). Maximum Stop Level — from 0 - 5 points ( 0.0 to 0.5 pips). Maximum freeze level — 0 points ( 0.0 pips). Show_Info_Panel — Information panel. (at the value false - Speeds up the testing in the strategy tester). Order_Comment— Comments to the order. Slippage — Allowed slippage before an order triggers. Max_Spread — Maximum Spread allowed before pending order is triggered. Fixed_Lot — Fixed lot ( if "Use_Risk_MM" = false ). Use_Risk_MM — At the value 'true' the lot size increases as the account balance grows. ( Risk Management ). Percentage_Risk — Increase the lot size based on balance. ( Risk Management % ). Take_Profit — Take profit level in points. Stop_Loss — Stop loss in points. Settings of moving Stop Loss to breakeven. Use_Break_Even — If this is true Stoploss price will be moved to breakeven when price is above target points. Breakeven_Target_PipsInp — When price is above this value breakeven will be triggered. Breakeven_Jump_PipsInp — Stoploss will be moved using this value to breakeven. Use_Trailing — If this is true, profit will be protected with trailing stop. Trailing_Stop — Trailing points, when the position is in profit. Trailing_Step — Trailing step, when the position is in profit. Adaptive_Trailing_to_slippages — Adaptive trailing stop. Change_correction_coefficient — Trailing sensitivity coefficient. Adaptive_by_Time — Algorithm of adaptive trailing by time. Time_Scale — Time interval for price analysis. Use time — If true trading will be performed by time. Time_Setting — Server time or computer time. GMT_mode = GMT offset of the broker server time; ( 0 - not used ). Every_Day_Start — Operation start time (hh:mm). Every_Day_End — Operation end time (hh:mm). Disable_in_Friday — Operation end time on Friday (hh:mm). 2016.08.17 I'm happy with this EA overall. I've learned that the result could really vary depending on the brokers. 2016.09.12 I need to know well how to use this EA, however I must say that it's yes profitable so far. 2017.06.02 Keeping good performance. Broker and VPS sensitive. 2017.06.26 June was a great month for Black Scorpion. 2017.10.20 All the benefits during two years had gone. Bye-bye money, bye-bye scorpion. Approved. Just need to fix the percent info on panel and setup 1% is showing 10% instead 1%. Подскажите какого брокира надо выбрать? For now this is great ea and excellent support from developer. I've bought this EA 2 weeks ago, I need more time for review it. 07/09/2016 On my account is not profitable, this EA is broker sensitive. 10/10/2016 I have bought this EA for 330 USD. Now cost is 150...This is a sort of insult for who have bought EA with higher price. I use it about two weeks. I have no problem to make loss trades as long as the trades are 90 % same like signals. You will never get the same result as his signal. i use also Icmarkets ecn account and vps with 2 ms ping but it is not possible get same trades. I agree with jffilters that this EA is very broker dependant. I have found only one broker that Black Scorpian performs well enough to earn one star. I've bought this EA 3 weeks ago and running it on a 5K Demo account with VPS from that time... Nearly only loss, using the exact same default parameter as recommanded. Actually around 18% of loss on the Demo account. Even looking the different EA Signal from the Author (2 Real and a Demo with different Brokers) the EA is not reacting the same way... The result of the EA seems Broker dependent. Plenty open trade and cancelled trade. Trade open during few seconds and closing with loss. Really disappointing so far. Added new modifications of the trailing stop. 1. Added hidden stop loss and take profit. Now the EA is not sensitive to STOP-LEVEL. The EA automatically selects whether to use the hidden stop loss and take profit or not. Auto_hidden_SL_and_TP - select automatically (default). 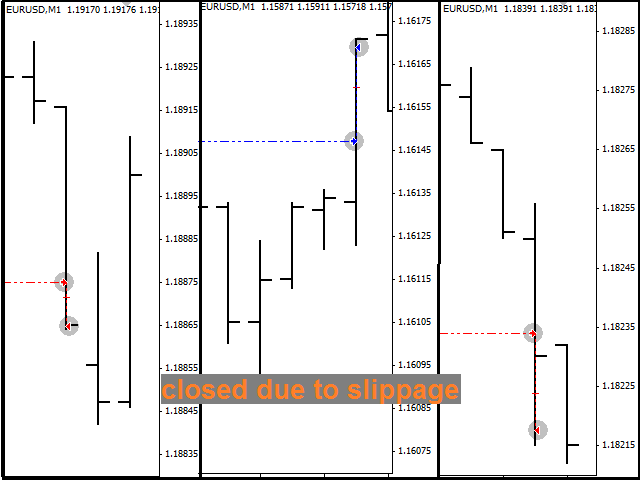 Use_Line_for_Hidden_SL_and_TP - show the lines of the hidden stop loss and take profit on the chart. 2. Added parameter: Visibility_of_pending_orders - visibility of pending orders in points. Fixed modification of stop loss: if STOP-LEVEL > 0. Fixed a bug related to order comments. Added slippage panel to check the broker. 1. Fixed the trading by time function. 2. Added protection against high spread: if the average spread is greater than the (max spread) variable, the EA closes pending orders and does not place new orders. 1. Improved the trailing stop system. 2. Improved the system of level breakouts. 1) Improved the "Risk Money Management" feature. Revised and improved the breakdown strategy. 1. Improved the breakout strategy.